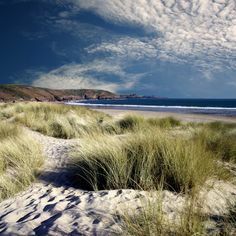 Known across the world for its awesome coastal scenery, protected by Britain’s only coastal National Park, Pembrokeshire is an explorers dream,with golden sands backed by towering cliffs teeming with wildlife and covered in a riot of flowers, especially in spring. 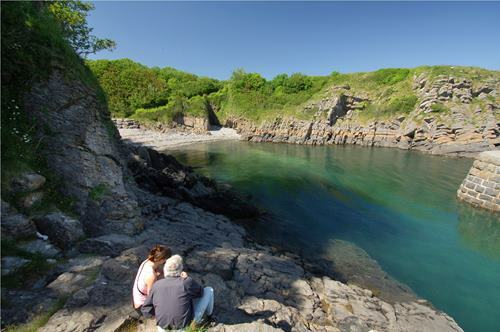 The Pembrokeshire coast path runs the length of the county and affords views to take your breath away. Crystal clear waters make it perfect for adventure activities like coasteeringand kayaking, for spotting dolphins, or seeing seals hauled up in secret coves. and it begins at Amroth. Is a short distance further along the coast from Bosherston. 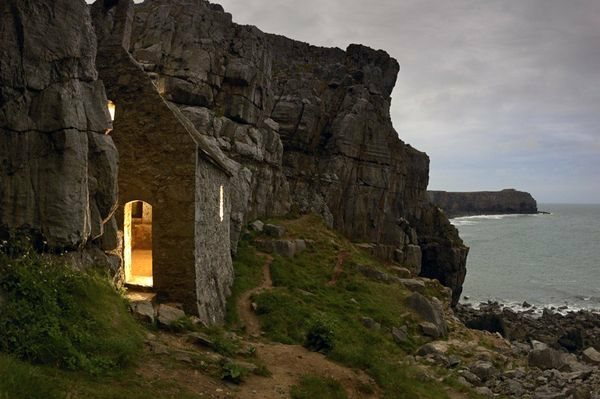 It is named after St.Govan who lived here in the 7th Century and you can visit the St. Govan's Chapel. located in a crevice in the rocks. From St. Govan's Head there are excellent walks along the cliff tops, enjoying the scenery, from the well maintained pathway. 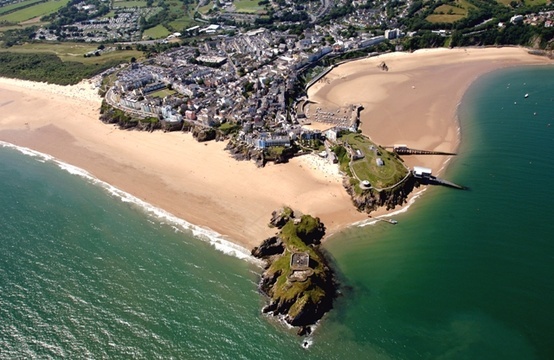 The Pembrokeshire Coast Path begins at the village of Amroth in the South of wales and in the North at St Dogmael 's near Cardigan. 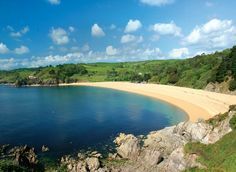 From here to the enchanting little city of St Davids , the trail passes through some of the wildest and most ruggedly beautiful parts of the National Park. Highlights of this section of the coast path include the Witches' Cauldron, a magnificent rocky bay; the historic little town of Newport with its Norman castle; the picturesque old harbour of Lower Fishguard; the pretty little fishing villages of Porthgain and Abercastle; Carreg Sampson, one of the finest cromlechs in Pembrokeshire; the golden sands of Whitesands Bay, where legend relates St Patrick set sail for Ireland; the little harbour of Porthclais, where St David was baptised; the ruined chapel of St Non's and the little city of St Davids with its glorious medieval cathedral and Bishop's Palace. From St Davids the trail follows the wide sweep of St Brides Bay with its beautiful beaches to the picturesque village of Little Haven with its narrow lanes cottages, old inns and tiny bay, and then continues around the Marloes and Dale Peninsulas to the busy port of Milford Haven , one of the largest natural harbours in the world. 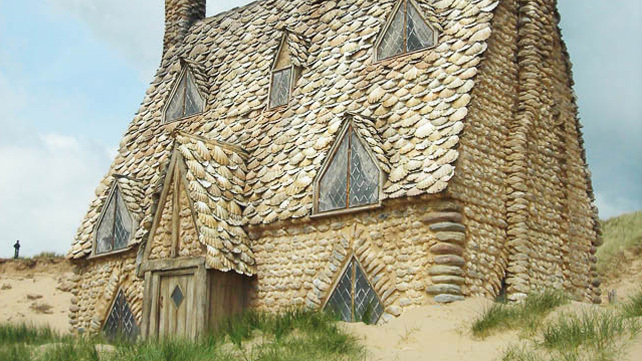 Highlights of this section of the coast path include the superb beach of Newgale Sands; the sheltered bay of Martins Haven, the embarkation point for Skomer and Skokholm islands; Marloes Sands with its multi-coloured cliffs; the little chapel at St Anns Head; the attractive fishing villages of Solva, Marloes and Dale; the gothic folly at Monk Haven; and the impressive Victorian fort at Dale Haven. 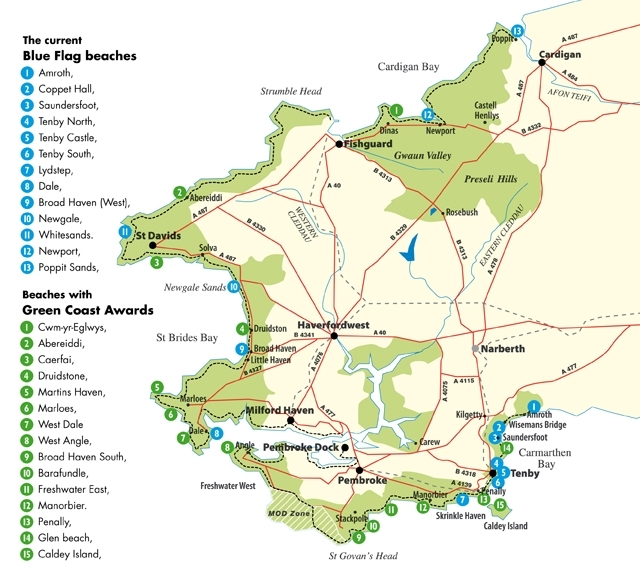 The southern section of the coast path from Milford Haven to Amroth takes in some of Pembrokeshire's most beautiful beaches such as those at Freshwater West, Broad Haven South, Barafundle Bay and Freshwater East, as well as some of its most magnificent cliff scenery, such as the spectacular limestone cliffs, stacks and arches of the Castlemartin Peninsula . Pembroke Castle, with its vast keep, which provides commanding views in all directions; the attractive village of Angle, with its historic church, Fishermen's Chapel, dovecote and medieval tower-house; the unique thatched seaweed-drying hut above Little Furzenip; the tiny, ancient chapel built into the rocks at St Govan's Head; the tiny harbour at Stackpole Quay; prehistoric remains including ron Age hill forts and Neolithic Cromlechs; the beautiful lily pools at Bosherton; the great Norman castle at Manorbier; and the ancient walled town of Tenby with its picturesque harbour are just some of the highlights.